What is Fight for the Reef all about? Fight for the Reef is a campaign about raising awareness of the industrialisation of the Great Barrier Reef. 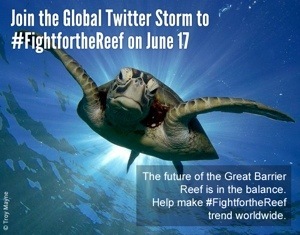 On 17th June 2013, a “Twitter storm” is planned to raise awareness and show the Australian government and World Heritage Committee that we want the Great Barrier Reef protected. Having visited Australia and completed my PADI Open Water scuba diving certificate at the Reef, I have great respect for the underwater world and the Reef needs to be protected.